Rhino K promotes more flowering sites with denser development and heavy blooms. The unique form of Potassium, combined with Vitamins and Fulvates ensures maximum nutrient availability while also increasing the transfer of key sugars. The pure 15% Potassium solution is ideal for creating more bud burst and should be used during the last 3 weeks of budding to harden and swell flowers during the later demanding stages of bloom. Fulvates maximise key nutrient movement, directing all energy and plant reserves towards bud formation and enhanced trichrome and increased oil production. 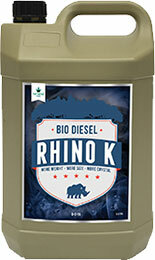 Rhino K is specially formulated to leave no harsh residues and produce a clean, heavy harvest without harsh chemicals or heavy metals.